Dress up your Corvette Stingray engine bay with our GM licensed, Stainless Steel Fuse Box Cover with "Corvette" Lettering. This piece, with its polished base and brushed face, boldly states "Corvette" across the front. With multiple color options to choose from for the lettering, you can make this piece uniquely your own. 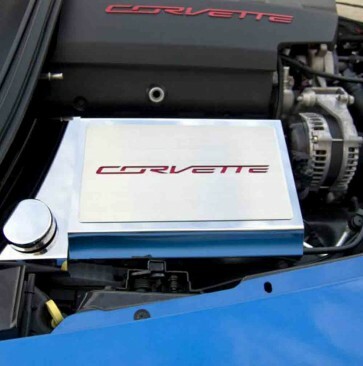 This accessory is designed to fit 2014-2015 Corvette Z06/Z51/C7 Stingrays over the existing fuse box and add a clean stylish look to your Corvette engine bay. May be returned, in resaleable condition, within 30 days from date of order with an RMA (Return Merchandise Authorization). A standard 15% re-stocking fee will be deducted from the refund amount. The customer is responsible for all shipping charges. Damaged items must be reported within 24 hours of delivery. Please allow up to 10-14 business days for delivery. May only be shipped using Standard Shipping.